This post is going to be short and sweet, just like the Pika itself. I don’t have much experience with this adorable little creature, but it deserves a full post nonetheless. After all, with its large rounded ears, dark doughy eyes and tiny rabbit-like body, it has got to be one of the cutest little animals on the planet! I had never even heard of the Pika before Sept of 2012. I did a hike to Lake Agnus Tea House (in Lake Louise) and my friends and I stopped by a rock slide area for a break. I kept hearing this high pitched ‘meeep’, and could not for the life of me figure out what was making that sound. It could have been a bird, but it was coming from the rocks, not the trees. I thought maybe a marmot, but I had seen marmots a few times before and don’t recall them making that sound. I scanned the rocks, and every once in awhile I thought I saw a flash of movement, but nothing held long enough for a good look. We continued along the trail and found a group of people pointing towards the rocks with their camera’s raised. I asked what they were looking at and they said the Pika, and pointed towards a tiny blur of light brown moving quickly through the rocks. ‘Hmmm – the Pika’, I thought to myself, ‘I must find myself one of those.’ I captured a few more glimpses of the Pika (and some blurry photos) on that hike, but it would be a full year before I got a chance to see one again. September 14, 2013 – on my usual route through Kananaskis/Spray Valley provincial park, I stopped at a rock slide area that looked like good Pika territory. I rolled down the window and could hear the high pitched ‘meep’, so worked my way to the base of the rocks. The meeep seemed to be coming from all directions – it was impossible to pinpoint a location based on the sound alone. I’m sure there were several Pikas around, but all I could do was wait and hope. Finally, a little brown figure scurried back and forth across some rocks in the distance. I tried to pan the camera with the movement, but it was way too quick. Luckily though, it would perch on a rock for a few seconds every once in a while, allowing me to focus and click. 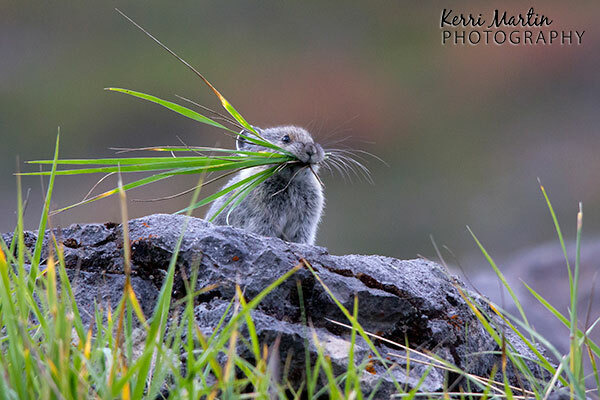 I was so excited to see the Pika in action, and absolutely ecstatic to capture him with a mouth full of grass. My lack of experience with Pikas means I do not have much to offer. I know they live in rock piles/slide areas in higher elevations, and the ‘meeep’ is a very distinct indication of their presence. The Lake Louise Tea House hikes, both the Lake Agnus and Six Plains Glacier, appear to be good spots (high elevation with lots of rocky areas). Another easily accessible spot is an area on the Highwood pass called Rock Glacier. It is near the summit and right along the road, so there is no need for a long hike. 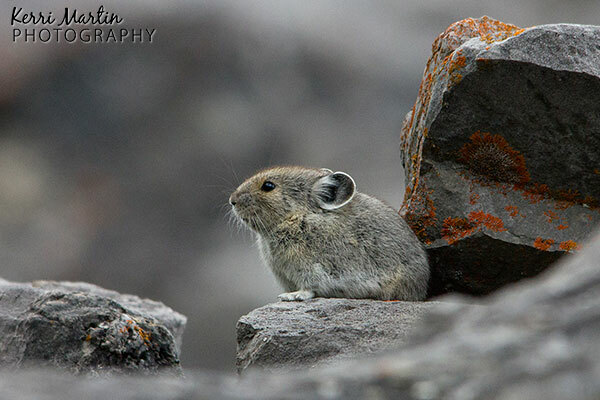 Here is a fantastic video of a Pika gathering vegetation for the winter. Given the behavoir described in this video, I suspect fall is likely the best time to see them out in the open. 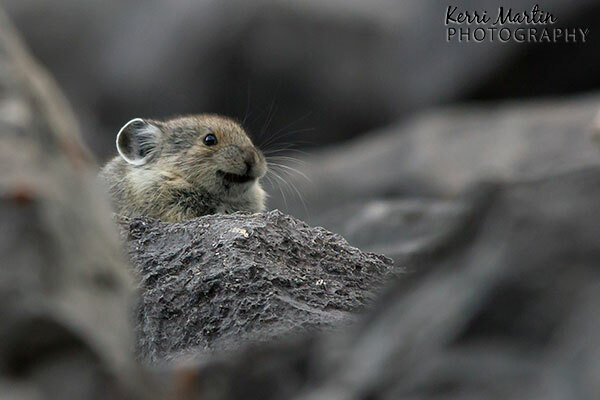 I hope to get a chance to see more of the Pika this summer.